Terminal Apotheosis - this bio has moved! Like the title says, this bio is now on my new account ;v; Crucio insists on me playing him again, so it's that time. It can be found here for those wishing to retrack. If not, that's okay too! This node won't be used again in the future, but I might keep it for old time's sake. There's a lot of history here - good and bad, and I think it's worth holding onto. Yeas , good times will come for sure !!! No prob , my friend And this mini who tried to attack you is jealous that SS is playing with you and me ( I was already involved in a fight with her because she kept attacking one of my friends ; i thought all was ok now ) And who is this friendly one with the skull that was with you ?? That was Mattias, he's one of Crucio's buddies. <3 He's real laid back and down to Earth, sweet bugger. He's really friendly. xD Same person who roleplays Wayneright (on profile above). Ah ! thank you , i really enjoyed this buddy too And for the mini ( best to ignore their attacks ) ! Morikiah loves Crucio and Crow face <3 even if he is a tad quiet and may not always show it. And I agree, sounds like good idea but Crucio's pretty touchy after that fight yesterday and he just lost his temper. Any normal day he'd probably just full out laugh at them for trying. LOL. Hey to you ! I found out that the one i was playing with when you were taking a rest was Yuj ! The doe belongs to Nirwana . She was the one with a skullmask , feathered antlers with gazelle pelt . Dinah - isn't she resting with my 6? xD zombie pelt, skull mask, realdeer antlers. his picto may be glitched/doesn't show up in the map at all. or then my came is just so laggy i see her sitting in front of him. LOL the pictos in my game are glitching again. My mistake! Tracking this anyway. LOL, fail @ EF. Ohwell. Ohwell. <: Crucio pretty much keeps the same set. 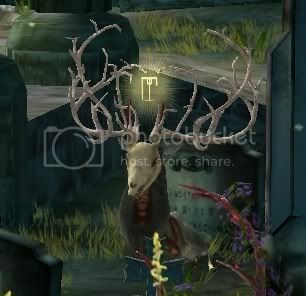 Took a while to find, but this is the stag my Leviathann stopped Gustiro from attacking, is it not? What a fun we had today !! I wish i knew who the other deer with skull mask and dodt pelt was . Ocean: Ohhh yeah. That was a big misunderstanding. Crucio saw that stag with the butterfly pelt guarding a doe and figured it was for a good reason. So when he saw this fawn getting pretty close and acting in a manner he considered impolite, he sniped at the little guy pretty good. Crucio HAAAATES fawns at the best of times, he's perfectly fine with does and stags but fawns, oh God. He can't stand them, finds them annoying and then some. All in all he was trying to help, but clearly that backfired. He needs to mind his own business. No , dampir has the same set but the picto did not match ! Ama was on the fence about Crucio because she saw how the fawn was acting and wondered if they were just playing or something. In the end, she decided not to interfere because the fawn clearly wanted a fight. No, it certainly wasn't Dampir, Lev's bumped into him before. c: And Gustiro was maskless with the zombie antlers and kabuki pelt. He had another deer with him: Sianna. Ocean: Ah, thankyou. <3 I need to be getting to know the community better.. it's just hard sometimes, especially if I don't see topics or get posts from the deer (and the people who play them) for me to refer to. Crucio wasn't actually responding to that fawn unless it made a move or nasty gesture first, that's just how he is. He's not really an instigator, never is. And that's the funny thing.. he IS quite polite usually, and especially with how he was acting earlier, felt obligated when he recognized Ama to try and explain in the best way a deer can. <: Mope. I had the orange/key antlered/skull masked stag that was with leviathann briefly. That was you right?